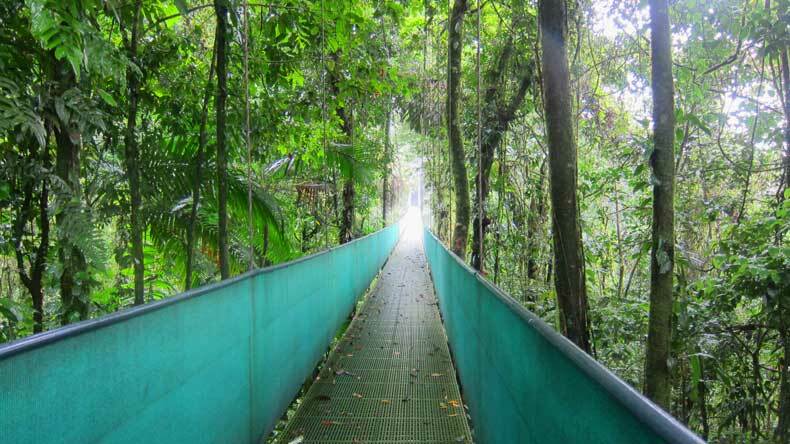 The Arenal hanging bridges tour in Costa Rica is an incredible experience immersed in nature. 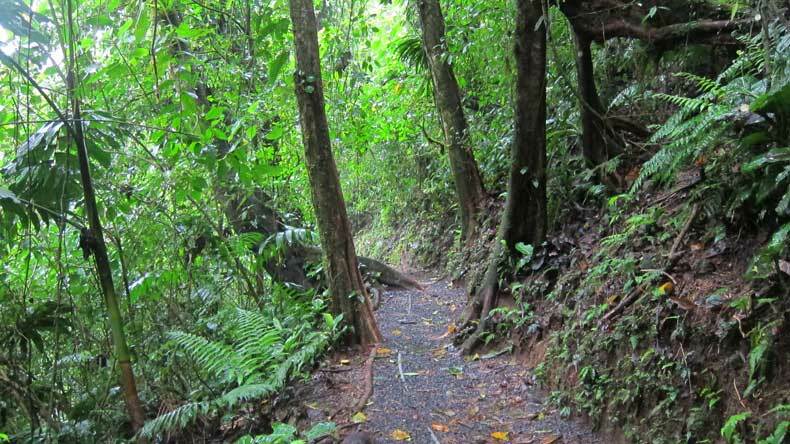 The guided hiking tour at Sky Adventures takes you through the Costa Rican rain forest and across five bridges. It may be one of the most beautiful hikes I’ve ever done, and it gives a unique perspective of the rain forest. The Arenal hanging bridges hike is about 3 miles long. While the hike isn’t extremely strenuous, it takes you up and down stairs on a defined but rocky and uneven path. While the tour is best known for the hanging bridges, only a small portion of that 3-mile long trek actually takes place on a bridge. You cross five bridges, and the path takes you by several waterfalls. At least three of the bridges are longer suspension or hanging bridges high up in the rain forest canopy. On a cloudy day, it feels like you are walking straight into the clouds. At times, you may not even be able to see the other side of the bridge. The Arenal hanging bridges tour is a guided tour, and can take several hours if you have a large group. They typically say it takes 3 hours to walk the three mile pathway. The guide will stop several times along the way to explain and point out different areas of the rain forest, unique vegetation, and even wildlife. There are bathrooms halfway through the hike and a water fountain where you can get a quick drink if you did not bring a water bottle. There are no age limitations for the tour. In fact, we were able to do this tour with our infant. We wore her in a carrier and she basically slept most of the way. This hike is a bit more strenuous than the ziplining tour, which is also offered at Sky Adventures. Wearing your baby, which would be the only way to do this with an infant, definitely requires being in decent physical shape. If you do not regularly workout, I would not recommend this excursion with small children. With that said, we had no problem with it. So if you are an adventurous parent and in decent shape, GO FOR IT! 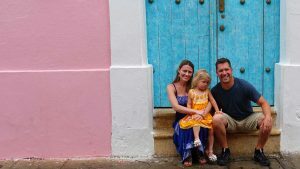 You could do this tour with a toddler or younger child, as well, but be prepared to carry them part of the way if they get tired of walking. I’d recommend bringing a child carrier, like this one, with you. You will also need to hold their hand along parts of the path where it is extremely uneven so they do not fall and injure themselves. The Arenal hanging bridges tour is not wheelchair accessible. If you have a physical handicap, you may not be able to do this tour. The group will stop from time-to-time as the guide highlights different parts of the route, so even if you aren’t in great shape you will have a chance to catch your breath. However, if you are extremely out-of-shape and tire easily, I would not recommend this tour. You should be in good enough physical condition that you can walk 3 miles and handle various change in elevation. The guides are very well informed about the rain forest and can provide a lot of interesting information, so there is an educational element to the tour, as well. This is a great tour for those traveling with older children, as it very well could spark an interest in biology and nature conservancy. 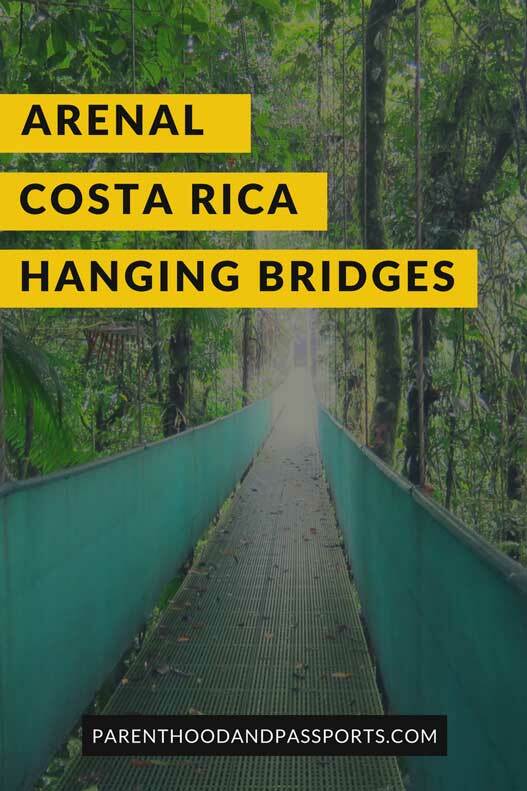 Having experienced this hike firsthand, here are a few recommendations if you are going to do the Arenal hanging bridges tour. Mosquito repellent are a must. We make our chemical-free repellent that works wonders! Bring a water bottle and a light snack, especially if traveling with children. I personally love this water bottle because it keeps your drink cold for 24 hours. 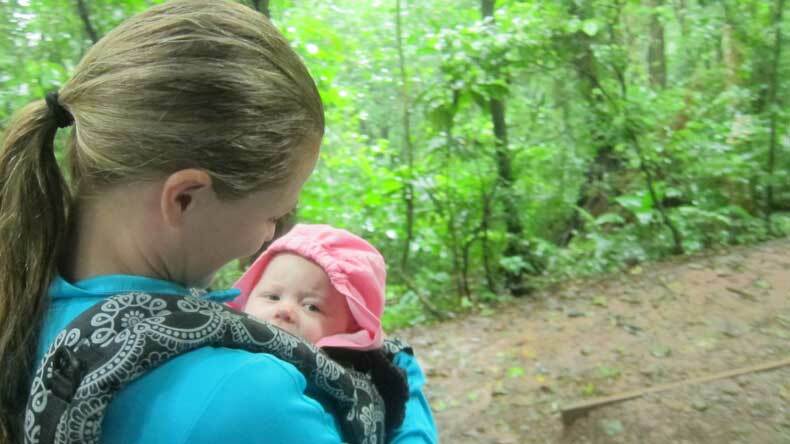 If you are hiking with a baby or toddler in tow, bring a bottle or sippy cup for them, as well. 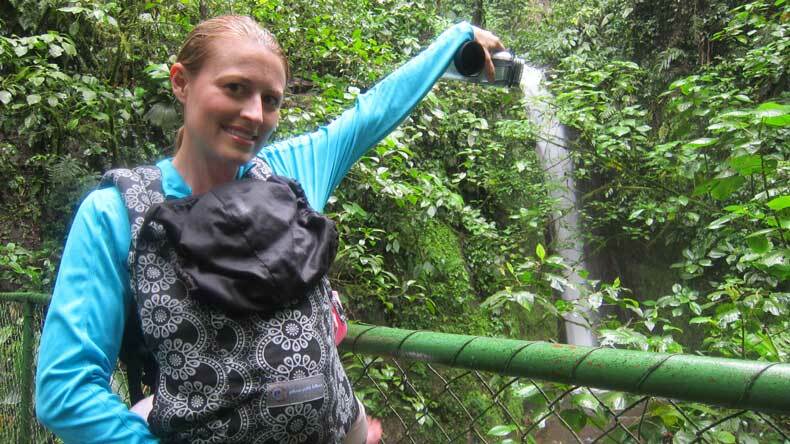 A child carrier or baby carrier is also recommended if doing this tour with babies or young children. 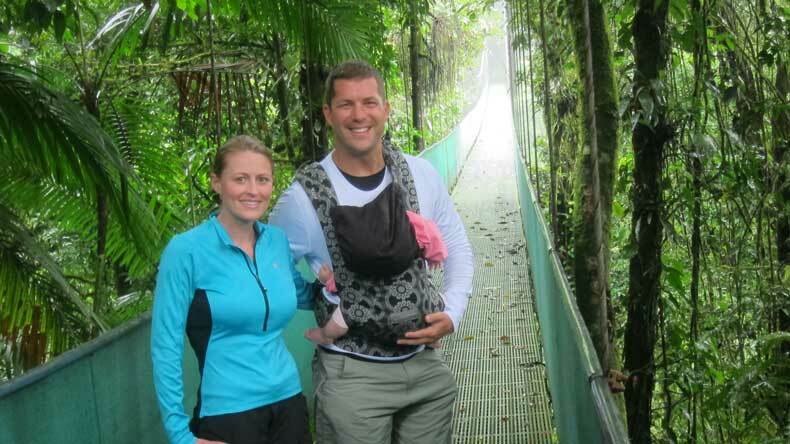 With the proper gear and expectations, the Arenal hanging bridges tour is a great family experience. 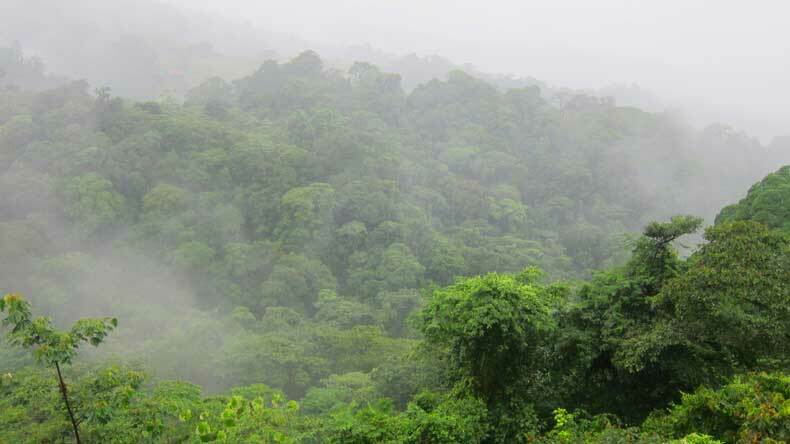 The hike is beautiful and you get to see so much of the rain forest and natural vegetation this way. Looking for more information on things to do and places to stay in Costa Rica? Check out our guide to Costa Rica here. Got a question or comment about the Arenal hanging bridges tour at Sky Adventures? We’d love to hear from you. Let us know your thoughts in the comments below.